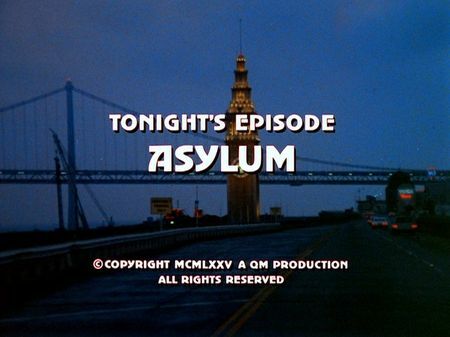 I have just added the screencaps for Asylum to the episodes' page. Murder inside a private clinic for psychiatric patients unsettles young female patient Susan, who suffers from a traumatic event which left her unable to speak, and another young patient, Pauk Bierce, who has somehow become a friend of her. Paul uses an excursion of a group of patients to get away, telling the police about the murder. He is upset by Mike's question if he was an employee or an inmate of the facilty, and when Paul cracks up he is sent back to the clinic. However, it does not take long until homicide is called into the institute for the death of Bierce who obviously hung himself. Considering Bierce's earlier visit to the department, Steve comes up with a suggestion: letting himself sent undercover to the clinic, performing as the drug addictve nephew of Mike, and trying to find out the backgrounds. Mike does not like his suggestion but with some briefing of the SFPD leading psychiatrist, Dr. Lenny Murchinson, as well as a well-dosed injection resulting in symptoms indistingishuable from an amphetamine overdosage. Steve makes it into the clinic and delivers helpful information from the files, and he can even establish a good rapport to Susan - which finally saves his life. Despite the limitation of filming locations to a very few, this is one of my favourite episodes of the season. Filming locations are quite limited as mentioned before. Dr. Rabb's institute is located at 300 Lake Street which was the real address given in the script. It actually was the building of St. Anne's home for the elderly and the poor, opened as early as 1904. Unfortunately, this remarkable building did not meet updated health and safety regulation and was declared unsafe by the mid-1970's. Today, the new St. Anne's home is sitting in the same location - but they kept the old wall and railings which can be seen in this episode. The group of patients are visiting the actual California Academy of Sciences in Golden Gate Park, another remarkable building that did not make it into present. The Academy buildings were damaged significantly in the 1989 Loma Prieta earthquake, so the complex was gradually closed and finally demolished in 2005, for a completely new building. Only one location is still standing upright, that being the house of the Wilcox which is located in the Pacific Heights district. I have cleared my archives and found a couple of double original ABC press release photographs - and I have decided to give them away for free. Please get in touch thru e-mail and let me know which one of the pictures shown is of interest to you; all you'd have to pay for is the actual postage to your destination country. In order to spread the photos in a balanced way, each interested fan may chose one picture he or she wants to have. Okay? Here's the pictures. Some still have the official press information on the back side, others show certain (minor) signs of use. The thumbnails shown are taken from my original pictures so the picture you get might have editorial remarks on its front side, normally written on the white border only and not onto the photo's motif itself (i.e. the photo was used by print media which use to add markings for the choice of display details etc.). The watermark does not appear on the actual photo, of course. 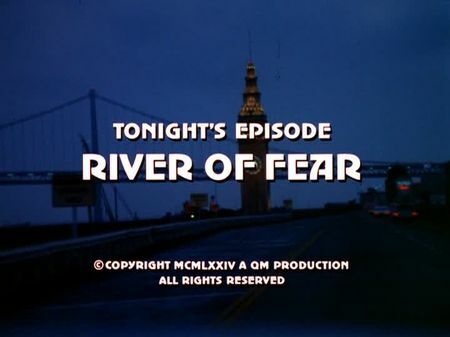 I have just added the screencaps for River of Fear to the episodes' page. We are introduced to Betty and Dr. William Dunson, an amorous pair in its prime of life, shopping in downtown San Francisco. We learn the couple was just married, and upon return to their hotel accommodation, Betty tells her husband that her late ex-husband who was involved in a heist bequeathed the complete theft, some 200,000 Dollars. Soon after, Dr. Dunson brtually knocks his wife down, mocking the crime scene to look like a bathtub accident. Homicide is called, and everything looks like a tragic accident indeed - until the coroner uncovers certain discrepancies. In the meantime, Dr. Dunson rushes back to Duncan Falls, home of Betty and her two kids, Bobby and Julie, pretending he wants to take care of the children. Further investigation by our two cops unveals the story behind Betty's late ex-husband, and an interesting detail concerning Dr. Dunson's vita. In fact, Dunson actually is James Cooper, an ex-convict from San Quentin, who not only used to know Betty's deceased husband and the story behind the 200,000 Dollar heist, but also killed him and faked the cause of death. He also knows that Betty's daughter Julie is the key as she is the only one aware of the money's location. Mike and Steve are on a race against the clock as Dunson seems to be game for everything. Filming locations include downtown San Francisco, more precisely at Union Square, as well as the Dunsons' hotel room which actually is located in the Hyatt Regency at Embarcadero Center. Some archive footage of season one was used when Mike and Steve are entering the San Quentin gateway, and the 'Duncan Falls' sequences were obviously filmed in Calistoga (Napa), although the exact location of Mrs. Rand's guesthouse is unknown. Unfortunately, nothing new on the expected DVD release of our favourite series' seasons 3 thru 5 in DVD regional code 2 (Europe, Japan). As we all know, seasons 1 and 2 had been released in the United States back in 2007 and 2008, followed by Europe and Japan in 2008 and 2009, respectively. Following a period of uncertain circumstances (reportedly related to the music copyright of some songs included in one or another episode of the series), seasons 3, 4, and 5 were finally released in the US between mid and late 2012. Seems as if Paramount forgot to think of the European format. Nonetheless, I will keep you updated in case I catch up any serious news on this topic. 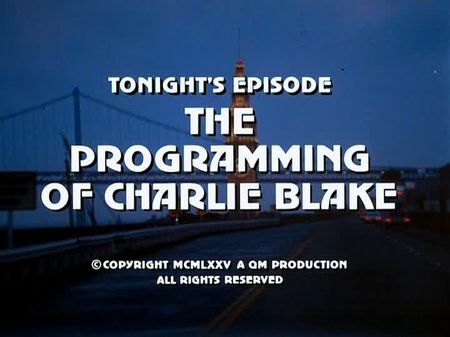 I have just added the screencaps for The Programming Of Charlie Blake to the episodes' page. When a young female student is found dead, homicide takes over in a case which soon turns out to having a certain pre-history. The victim's roommate states that her late friend had received obscene phone calls in the recent past, so everything points at a sexual offender with a psychopathological component. The department's widely spread investigation among registered sexual offenders of the area leads Mike and Steve to two suspects who do not really have a valid alibi for the time of the offense: one of them, Charlie Blake, has had severe problems with what we would call 'obscene phone call stalking' these days. However, Blake is a rather sincere and remorseful ex-criminal who does everything he can to get his life together again. His fragile situation is completely mixed up by the police questioning which associates Charlie with obscene phone calls again - and murder. He immediately calls his psychiatrist for an urgent appointment. We as the audience learn that Charlie's psychiatrist, Dr. Norman Jessup, starts to play a double game. Charlie serves as the perfect instrument to getting rid of Jessup's wife who just discovered her husband is having an affair. Using hypnotic skills, Jessup first suggests that Charlie stalked and killed the young student, and then orders him to come to his house by night. The whole scenery is well-prepared and Charlie walks right into the trap. However, Steve smokes something - Jessup's alibi is absolutely perfect, and that makes him think. While visiting the crime scene again, Mike makes an astounding discovery; but they need to prove that Jessup perfectly prepared the scenery. Filming locations are limited to five spots in this episode. These include Telegraph Hill for both, the initial crime scene as well as the apartment of Blake's current girl friend, plus Forest Hill for Dr. Jessup's house. Charlie and Jill are having lunch in a restaurant on Davis Court, and the epilogue was filmed on the steps of San Francisco City Hall.